Pietro (Elio Germano) spends his evenings working nightshifts in a local bakery. He has just moved to Rome and has big dreams of becoming a successful actor. He finds a very beautiful old apartment, which despite being in need of a little repair has an unbelievably cheap rent. This place seems just so perfect! But soon after settling in, he notices that objects get moved around and there are strange noises coming from the empty rooms. It soon becomes clear that he is not living alone. Determined not to run, Pietro tries everything he can to get rid of the seven and a half other worldly beings who have been resident in the house since World War Two. But this mysterious ghostly theatre company will not leave. Over time they all fall into a routine of domesticity and Pietro realises that he now has a group of friends that he can share his desires, fears and secrets with. But what happened during the Second World War to confine them all to this old house? What is the secret behind the tragedy of this ghostly theatre company? Pietro is determined to find out; his search for the truth takes him on an astonishing journey. Ferzan Özpetek, the Turkish-born director of the award winning comedy Loose Cannons [Mine vaganti] and Hamam [The Turkish Bath], returns with A Magnificent Haunting [Magnifica presenza], a charming fantastical comedy that explores themes of love, friendship, and mortality. Visually stylish with a dreamy soundtrack, it has found international acclaim winning four of Italy’s golden globes including best picture and best actor for Elio Germano (Romanza Criminale, Nine). A Magnificent Haunting reconfirms his position as one of the most inventive contemporary European filmmakers. 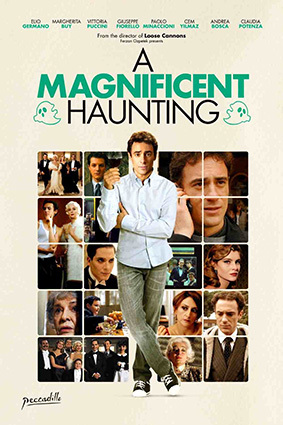 A Magnificent Hauntingwill be released on UK DVD on 11th November 2013 (next Monday!) by Peccadillo Pictures at the RRP of £12.99.